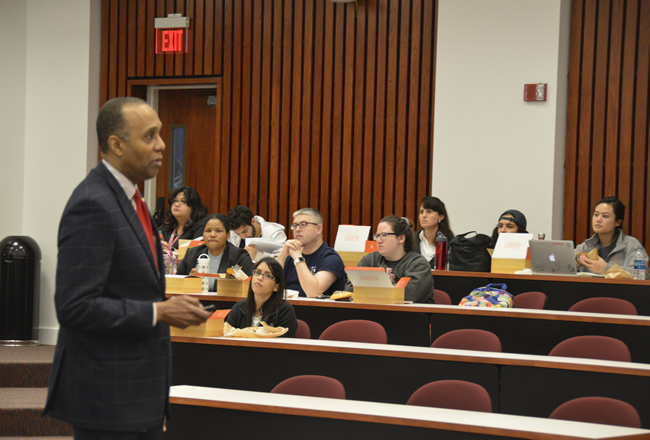 Dean Leonard M. Baynes recapped recent developments in two sessions of 'Discussion with the Dean' last week at the University of Houston Law Center for day and evening students. Nov. 14, 2017 — University of Houston Law Center Dean Leonard M. Baynes provided an update on plans for a new law school building and mentioned upcoming facility upgrades at his biannual, "Discussion with the Dean," last week. "We are moving forward with a new building," Baynes said. "It will be a major objective for the next legislative session. We have made progress, raising $3.2 million out of $10 million of the Cornerstone Club serving almost as a 'down payment' when we ask the state legislature for money in the 2019 legislative session." Baynes also mentioned plans for a C-Store in the space that was formerly a Subway. The store will be similar to the location in the UH Student Center and will offer a variety of menu items, snacks and other provisions. "We want our students to be as comfortable as possible," Baynes said. "The C-store will be very interesting and revolutionary in that it will be partially automated. There will be someone there during the day, but it will be automated at night for our evening students who want to grab a cookie, coffee or whatever they want." Baynes provided a year in review of Law Center happenings, including his domestic and international networking trips, the largest graduating class of the Pre-law Pipeline program over the summer, the Law Center's response to Hurricane Harvey, the visit from the Supreme Court of Texas, faculty and staff promotions, and retirements among other issues. There was also a moment of silence held for members of the Law Center community who have passed away in the last year. Following Baynes' talk was a presentation from Robert Browand, director of Parking & Transportation, and Neil Hart, executive director of Auxiliary Services. The two discussed updates to faculty and staff lots and made themselves available to answer questions from students.